The first in an occasional series offering a satirical look at VC propaganda. These children are being empowered to ride on this busy road – but only when dressed as builders and being shepherded by a group of luminous adults riding defensively. 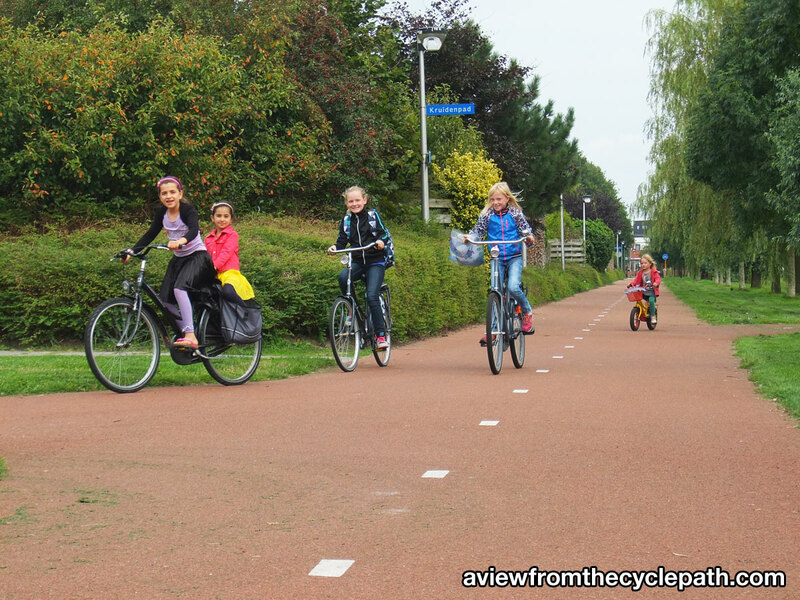 Of course, we wouldn’t want empowered children cycling safely and independently by, say, converting half of that road into a physically protected cycleway. No no no, that would be giving in to the motor industry. It would mean that the cars had won. The only way we militant cyclists can defeat the motor menace is by getting children to cycle amongst fast, heavy motor traffic. Sorry for the long intro, it just happened by accident. Click here to jump straight to the pictures! Over two years ago I posted this article featuring images where I’d cut out people from photos of the Netherlands, and placed them in typical British urban scenes. They were well-received and seem to have been shared widely. My favourite response was from this guy who described how you can tell by the shadows – the shadows! – that the toddler isn’t really cycling around the Elephant and Castle gyratory. The intention was to show that to make cycling an accessible transport choice for anyone in Britain, we need to change the roads. Training and encouragement just won’t work. The vast majority of people don’t want to cycle amongst motor vehicles – well driven or otherwise – and huge sections of society simply wouldn’t be physically able to. Funnily enough, I was recently reading some old posts on the much-missed Crap Waltham Forest blog and came across the image below, created by training company CTUK, used to promote their services some years ago. Don’t worry about the driver that’s about to undertake you – you’ve had training! How I laughed! That’s Waterloo Bridge in London she’s supposedly riding on (ignore the cut-and-pasted St. Paul’s cathedral dome), and I can assure you that few people experience such carefree joy while riding across there. Photoshop to the rescue. The idea that cycle training will make you smile with glee whilst riding in the outside lane amongst speeding motor traffic towards the terrifying maelstrom of taxis that is the Waterloo Imax roundabout is just pitiful. But what I found funniest of all was that this image could easily have been on that previous post of mine. It’s a ridiculous juxtaposition of what cycling should be like and what cycling in the UK is actually like. But while my images were designed to show how ridiculous it is to expect people to cycle amongst heavy motor traffic, this image was being presented as a positive vision to promote cycle training! I can see now why the guy on the Birmingham forum thought that this was a pro-VC image, as my satire was only one step removed from the propaganda released by vehicular cycling advocates themselves. 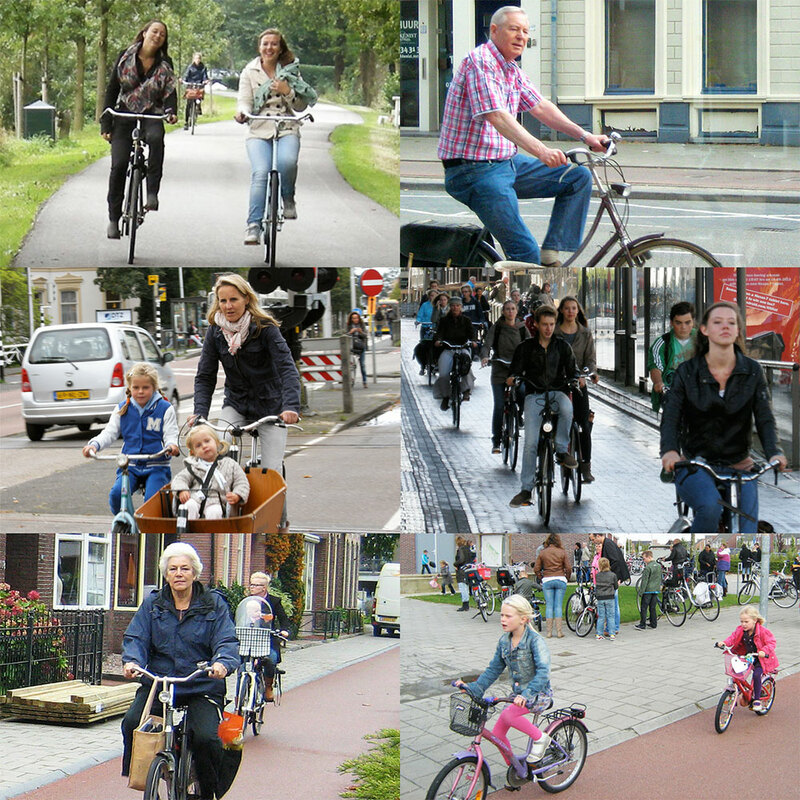 Vehicular cycling flat-Earthers will clutch at any straws to suggest cycling amongst motor vehicles is preferable to Dutch-style cycleways, whether it’s misrepresenting reports and statistics, or presenting rare, stage-managed occurrences as normal. 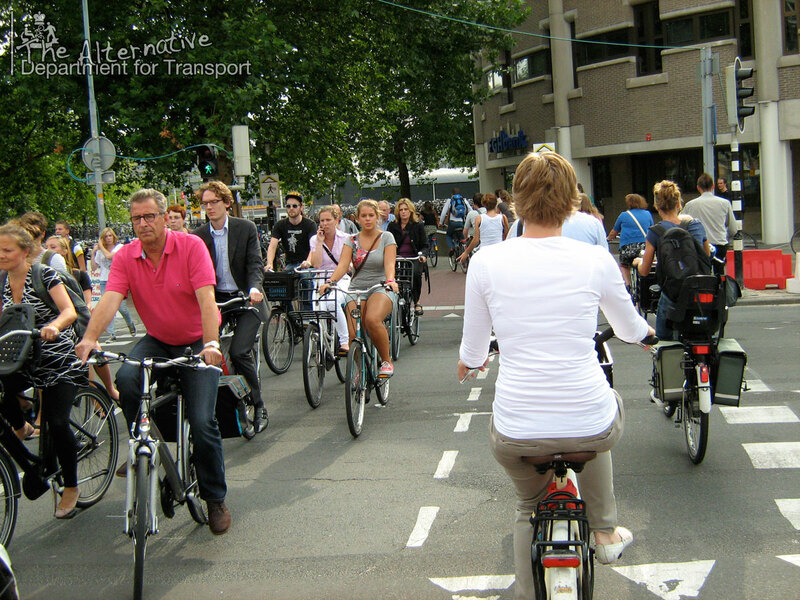 Unfortunately, while vehicular cycling training may indeed help a small number of individuals, it simply isn’t a route to mass cycling – though the training industry won’t say this, as they presumably don’t want to offend their friends with the chequebook at the (real) Department for Transport. Epilogue: I shouldn’t have to say this again, but here it is anyway: I’m not against cycle training per sé – if someone wants to ride a bike bike in the UK today and they want advice on how to do it, then fair enough. Nor am I against vehicular cycling as a method of coping with Britain’s awful roads. But to suggest that vehicular cycling training can have anything more than a miniscule effect on the number of people cycling is nonsense. Cycle training is not a route to mass cycling. Even some of cycle training’s biggest names admit that cycle training just isn’t reaching the masses. And after yet another cycling death involving someone with plenty of cycling experience, how much skill do we expect the average person to possess in order to cope with riding a bike amongst motor vehicles? Are you annoyed that the politicians use you to suppress cycling? This probably comes as no surprise, political figures spouting nonsense is nothing new, after all! Personally, I would be very annoyed if my work was being misrepresented, and used as an excuse to ignore real cycling provision – and unfortunately that’s exactly what’s happening with you. 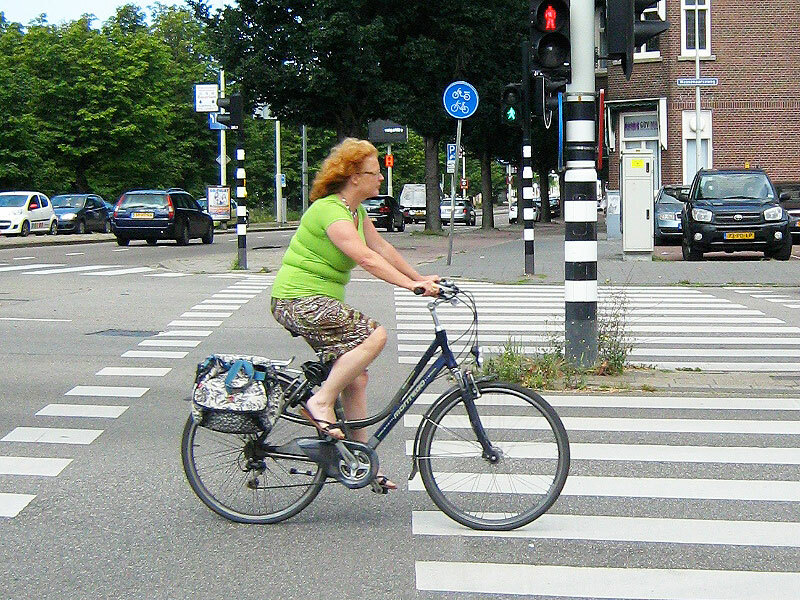 Time after time, we see those in power refuse to support proper cycling infrastructure – good quality cycling infrastructure, enabling cycling for all, regardless of ability, as can be found in the Netherlands – and one of the frequent excuses given is that cycle training is offered instead. What they mean by this is that the government throws some money at the cycle training industry. I know it’s not much money in the grand scheme of things, not enough even to teach every child the basics, and yet some of those in power then consider it “job done” as far as cycling is concerned. Here’s an MSP in Glasgow refusing to support space for cycling, using training as an excuse. Doesn’t that make your blood boil? Here you are, trying to do some good, and these politicians are using that as a reason to wash their hands of responsibility! Here’s another politician, in London, cherry-picking a very rare situation as part of an ongoing campaign against the type of infrastructure that’s proven to be safe for everybody. Central government frequently trumpets the number of children who have received Bikeability training as if this is a goal in itself, ignoring the fact that very few children actually then put these skills to use by cycling for transport. Surely this must bother you? I can see you being wary of biting the hand that feeds you – the (other) Department for Transport’s logo is on your website, I guess you must receive funds from them – but isn’t it time to issue a statement which will prevent the politicians’ divide-and-rule, infra-versus-training debate once and for all? I’m often told that training is not in opposition to infrastructure, and this is a good chance to prove it. As an industry, you surely support the principle of investment in high-quality cycle infrastructure. TABS’ website states that their ultimate aim is “more people taking trips by bike more often and more safely” (and some of your most prominent people are in favour of cycleways). As we all know, “more people taking trips by bike more often and more safely” will only happen when people feel safe and comfortable travelling by bike – which inevitably means not having to cycle amongst lots of motor vehicles. Surely you’d much rather be teaching every child in the country the rules of the road on safe infrastructure? Perhaps, with your help, one day the UK will be a country where eight years old is considered late for independent cycling! So I’m asking you to issue a press release, or add a page to your website, to make clear that training isn’t an alternative to proper infrastructure, but is instead an adjunct to it. Let the politicians know that throwing a few quid at Bikeability isn’t enough to create mass cycling in the UK, and that they can’t continue to design roads solely for motor vehicles any more.